Acoustic players rejoice! 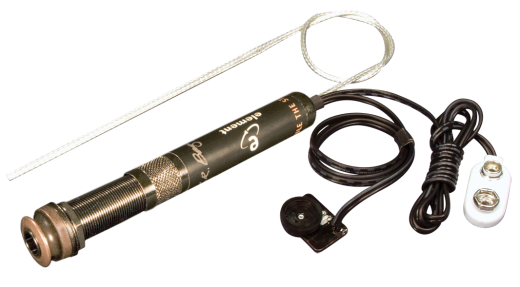 LR Baggs has developed a undersaddle transducer and preamp for steel string acoustic guitars called the Element Active System (EAS). The EAS pairs the Element with a discrete 'Class A' end pin preamp and includes a small removable sound-hole-mounted volume control for added versatility. The EAS also includes the 'Battery Bagg', used to unobtrusively house the battery inside the guitar. All of LR Baggs' systems are engineered to assure great sound and hassle-free performance right out of the box. They make many different systems from simple to complex. Each is designed for a specific purpose, but they have only one quality level -- the very best they know how to build. Choose the right system for your application and budget and you will enjoy its great sound and performance. The streamlined and efficient design removes every unnecessary internal component to improve the coupling between the transducer and the guitar. This substantially improves the sensitivity of the transducer for a robust, lively and open sound with great dynamics and a delicate high end. Installed on my Martin D18 and I couldn?t be happier. Really easy to install. Sound quality is fantastic. Loud & clear . Couldn?t be happier with my purchase. Matt at L&M was very helpful. The world of pickups can be trying and tiring but hey...no lack of selection. I had one of these installed in a Larrivee L09 a long time ago and it is fabulous.Good honest tone.I still cant believe that I have never wished for the tone wheel which speaks to the pickup's voicing...but here I am buying another one for a parlor guitar and I think I may pony up for the tone wheel due to the parlor being brighter,and I create a lot of string talk on certain songs. I cannot imagine somebody not liking this pick up as it seems uncolored and has no piezo quack or other weird tonal artifacts.Voiced right,buy it. Read a lot of reviews and decided to go with this for my Laravee D02. An amazing pickup very loud and clear with no piezo quack. Just true acoustic sound like it was miked. Price was affordable compared to other like systems. Great thing is no large hole to cut for preamp and controls. Over all a great choice. I purchased the LR Baggs Element system after reading several great reviews online. It took approximately 1.5-2 hrs to install on my Little Martin (small sound hole difficult to move around) All I can say is that the reviews were correct, this pick up sounds amazing both for recording and playing through a PA... Also no extra holes in your guitar which is nice. If your looking for great pick up in your acoustic this is definitely the one!